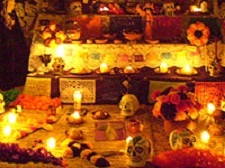 El Día de los Muertos (Day of the Dead) commemorates the transitory return to Earth of deceased relatives and loved ones. The festivities take place each year at the end of October to the beginning of November. This period also marks the completion of the annual cycle of cultivation. Families facilitate the return of the souls to Earth by laying flower petals, candles and offerings along the path leading from the cemetery to their homes. The deceased’s favorite dishes are prepared and placed around the home shrine or altar and the tomb alongside flowers and typical handicrafts, such as paper cut-outs. 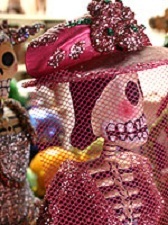 The Day of the Dead celebration holds great significance in the life of Mexico’s indigenous communities. The fusion of pre-Hispanic religious rites and Catholic feasts brings together two universes. Foreigners have more trouble understanding Day of the Dead than any of Mexico’s other fiestas. At first glance, Day of the Dead decorations, colored paper garlands, little skeletons performing daily tasks and sugar skulls inscribed with names remind visitors of Halloween. Others discover that much like Memorial or Remembrance Day back north, families here visit, clean and decorate graves of loved ones for the November 1 and 2 holidays. This holiday is a perfect example of the complex heritage of the Mexican people. The beliefs of today’s Mexican are based on the complicated blended cultures of his ancestors, the indigenous groups and Spanish conquerors, layered with Catholicism. The origins of the Days of the Dead reach into the ancient history of Europe and Mexico. In the eighth century, the church decreed November 1 as All Saints Day. Setting aside the day to honor the martyrs and saints was an attempt to replace the 2000-year tradition of the Celts and their Druid priests who combined harvest festivals and celebrated the new year on November 1. The Celtic dead were believed to have access to earth on Samhain, October 31st, when the boundary between the worlds of the living and the dead relaxed. The Celts danced around huge bonfires, wearing animal heads and hides to confuse the spirits and burned crops and animals as offerings to the returning dead. Around the end of the first millennium, the church reinforced its attempt to cover the Celtic celebration by designating November 2 as All Souls’ Day to honor the dead. All Souls’ Day was celebrated with parades, big bonfires and the people dressed as saints, angels and devils. In the language of the day, All Saints Day and All Souls’ Day were known as All-hallowsmas, and October 31 was “All Hallowed’s Eve” or Hallow’e’en. When the Spaniards arrived in Mexico they encountered two-month celebrations honoring death, the fall harvest and the new year. 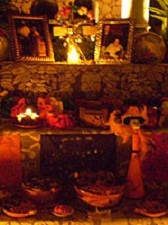 For more than 500 years, the goddess Mictecacihuatl (Lady of the Dead) presided over Aztec harvest rituals using fires and incense, costumes of animal skins, images of their dead and offerings of ceramics, personal goods, flowers and foods, drinks and flowers. 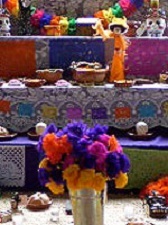 While the church attempted to transform the joyous celebration to a suitably tragic image of death and a serious day of prayer focusing attention and reflection on the saints and martyrs, the people of Mexico did not fully adopt the early priests’ ideas, and by keeping their familiar ceremonies, All Saint’s Day and All Soul’s Day evolved into the celebrations that today honor the dead with color, candles, music and joy. Daily life in ancient Mexico was so uncertain and difficult that death was expected at every turn. Death, in fact was revered, believed to be the ultimate experience of life, life’s own reward, even welcomed as a better option when people are struggling for survival. The Mexican still views death as a transition of life, a normal stage in the circle of life on earth, a natural progression, not an ending.